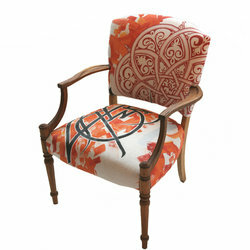 I perceive Calligraphy as a tangible expression of my search for identity. Throughout my work, a myriad of paths intersect and mirror the multiple sources of inspiration which nourish my art. struggling yo legitimize its presence in the contemporary art scene. This duality enables the reconciling of two supposedly opposing worlds and two supposedly clashing cultures. I try no longer to paint my name on walls. I have decided to adopt a proverbial tradition, in which the name disappears and only the message remain. Therefore, rather than searching for what distinguishes me from another artist, I search for what unites me with others. My art is a link, an arm outstreched, a bridge towards thos who are open to my message. EL Seed لم يقيم بعد. I perceive Calligraphy as a tangible expression of my search for identity. Throughout my work, a myriad of paths intersect and mirror the multiple sources of inspiration which nourish my art. 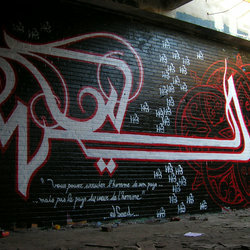 My art, Calligraffiti, is a mixture of graffiti and Arabic Calligraphy. 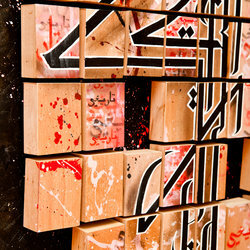 Calligraffiti is the product of a double marginality, that of an oriental art-seeking voice in the occidental world and that of graffiti, struggling yo legitimize its presence in the contemporary art scene. This duality enables the reconciling of two supposedly opposing worlds and two supposedly clashing cultures. I try no longer to paint my name on walls. I have decided to adopt a proverbial tradition, in which the name disappears and only the message remain. Therefore, rather than searching for what distinguishes me from another artist, I search for what unites me with others. My art is a link, an arm outstreched, a bridge towards thos who are open to my message.